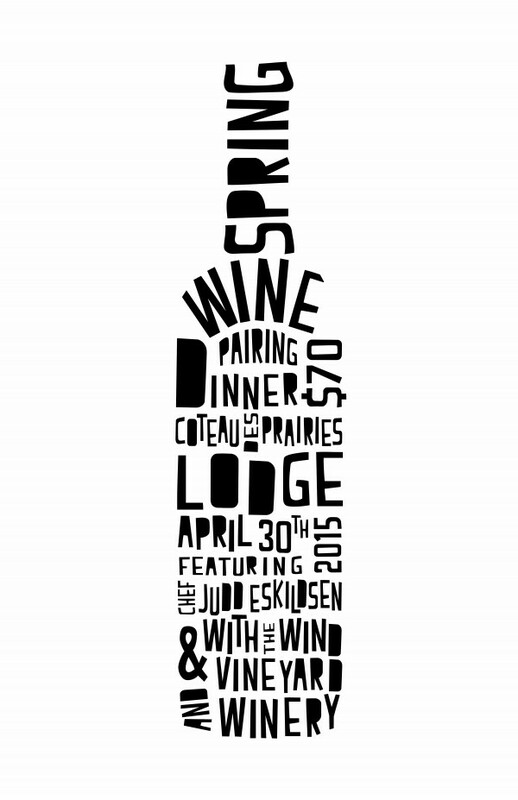 Join us at Coteau des Prairies Lodge on Thursday, April 30th for a one of a kind food & wine pairing event featuring local wines from With the Wind Vineyard and Winery and the the culinary talent of Chef Judd Eskildsen. At our Spring Wine Pairing Dinner, you will have a unique opportunity to experience With the Wind’s wines expertly paired with gourmet food. Five courses to be exact. Jeremiah Klein, owner of With the Wind, will introduce each of his wines and share stories from his experience of starting a winery with his wife and kids near Rosholt, South Dakota. Chef Judd Eskildsen will describe the pairings as each course is served. In addition, we will be featuring our 28 Day Dry-Aged Breker Beef in the fourth course. Our unique 28 day dry-aging process was developed by Coteau des Prairies Lodge in collaboration with a local butcher who processes the beef. Of course, we begin by selecting our beef from the very best animals raised and finished right here on the Joe Breker and Jeff Breker farms. Resting atop the rolling prairie near Rosholt, SD, With the Wind Vineyard & Winery marries the panorama of the peaceful sunsets with each their handcrafted wines. Owners, Jeremiah and Lisa Klein, along with their three children work and play together as a lively, loving family. Developing their new business, With The Wind Vineyard & Winery, from the ground up has been a true journey of freedom. Since the acquisition of their property in the winter of 2012, the Kleins have spent countless hours together uncovering the true beauty of the South Dakota landscape around them and realizing that treasures of grace abound and inspire for the future. Together, they have planted a one and a half acre vineyard where they currently grow four varieties of grapes: Brianna, Frontenac, Frontenac Gris and King of the North. The newly constructed With the Wind Vineyard & Winery facility houses a full grape processing and wine fermentation area complete with six large, custom-made Italian stainless steel fermentation tanks. Jeremiah and Lisa take pride in crafting premium, dessert-style wines and seeing the enjoyment of the people they meet along their journey. Judd (Justin) Eskildsen was born and raised in Moorhead, MN, and has been in love with cooking since he was old enough to help roll wontons with his Mom. After 8 years of being an industrial welder, Judd realized that his heart never truly left the kitchen, and he decided to follow his dream of becoming a chef. Since then, he has worked in some of the best restaurants in Fargo and Moorhead. From his Mom’s meatballs and gravy, to his Uncle Doug’s BBQ, the hearty, comfort food that Judd grew up on has always been very prevalent in his dishes. Although he has never had any formal training, the chefs and cooks he has worked with over the years have all played a part in him becoming a top tier chef in the area. This will be Judd’s first wine pairing event where he will have the opportunity to independently create a multi course meal showcasing his own skill and interpretation of flavors. He recently dazzled us with an incredible pairing menu at our Drekker beer dinner. Currently, Judd is a Sous Chef working under Executive Chef Steve Schulz at The Toasted Frog in downtown Fargo, ND. The event is on Thursday, April 30th at Coteau des Prairies Lodge. Everyone is welcome, but space is limited and meals are available by reservation only. Alcohol will be served only to those over 21 years of age. The price is $70 per person. The meal includes a gourmet five course meal and 3-4 oz. of wine served with each course. Water and coffee will be provided. Sodas and additional alcoholic beverages will be sold at the bar. Doors open at 4pm, guests are welcome to come early, tour the lodge and enjoy refreshments served at the bar. When you arrive at the lodge, sign your party in with our hostess. Guests will be seated for the meal promptly at 6pm.